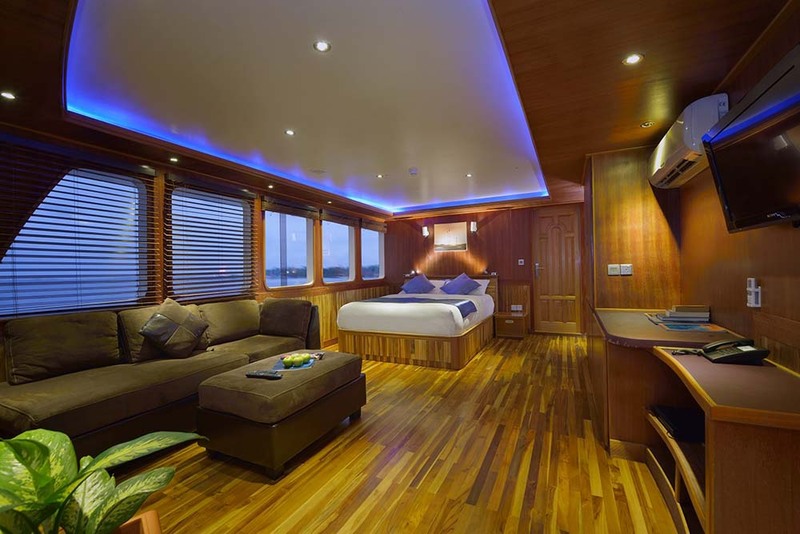 Since its launch in 2012, the Maldives Princess liveaboard has quickly established itself as one of the most popular luxury Maldives liveaboard diving yachts. 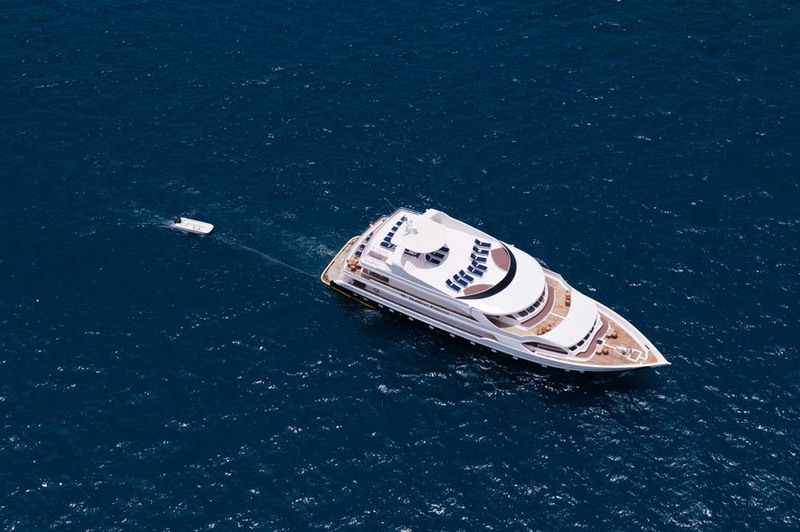 The vessel is 43m. 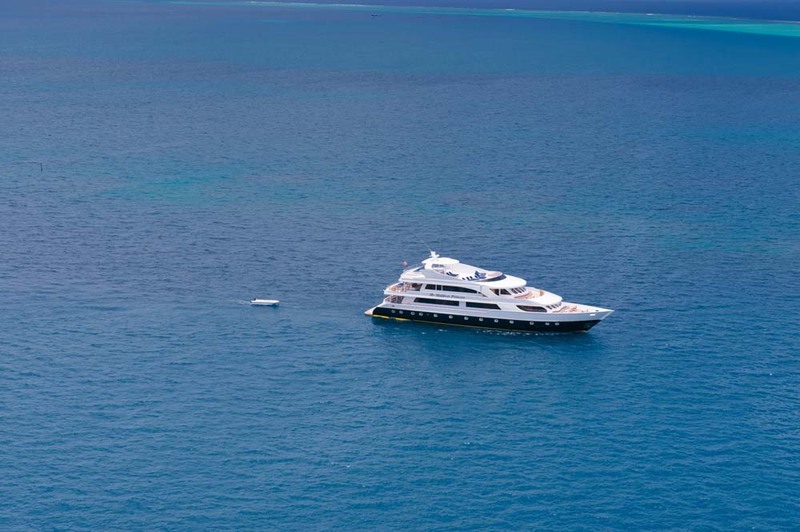 in length but takes just 22 lucky guests on week-long Maldives scuba diving safaris to enjoy some of the best diving in the world. 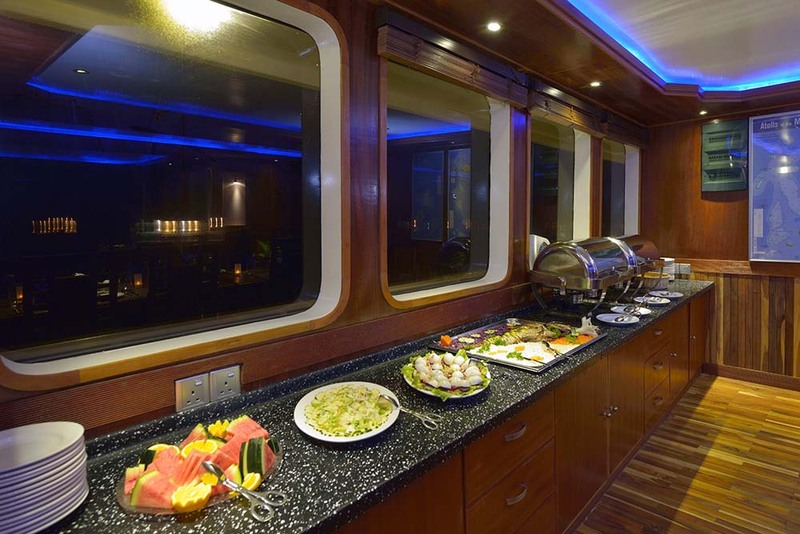 The crew of 13 are always on hand to offer 5-star service, delicious food and a wide range of refreshments. 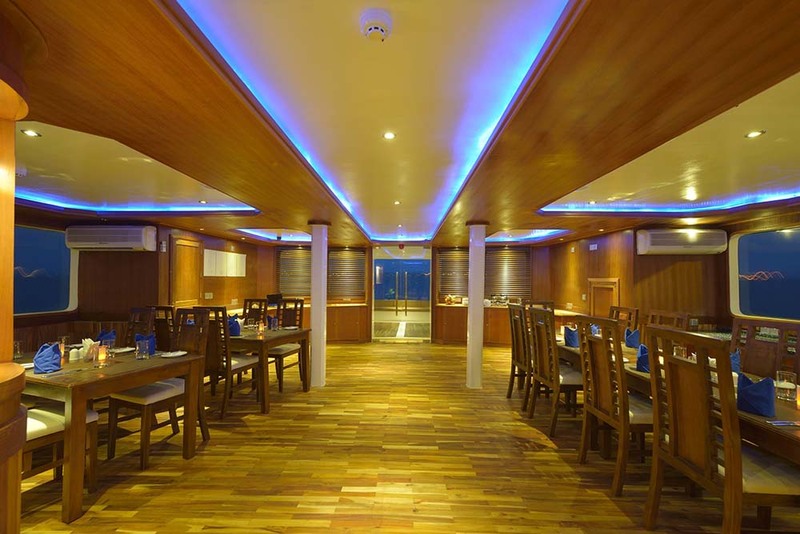 For discerning divers who want the best in luxury Maldives diving there is nowhere better to start than Maldives Princess liveaboard. 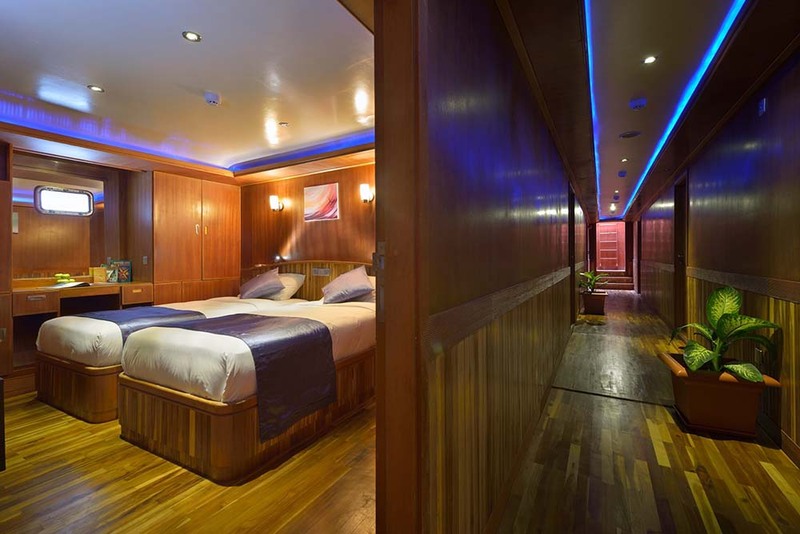 The communal areas of Maldives Princess include indoor air-conditioned lounges and dining areas, outdoor seating, a bar, several sundeck areas, and an on-board Jacuzzi. 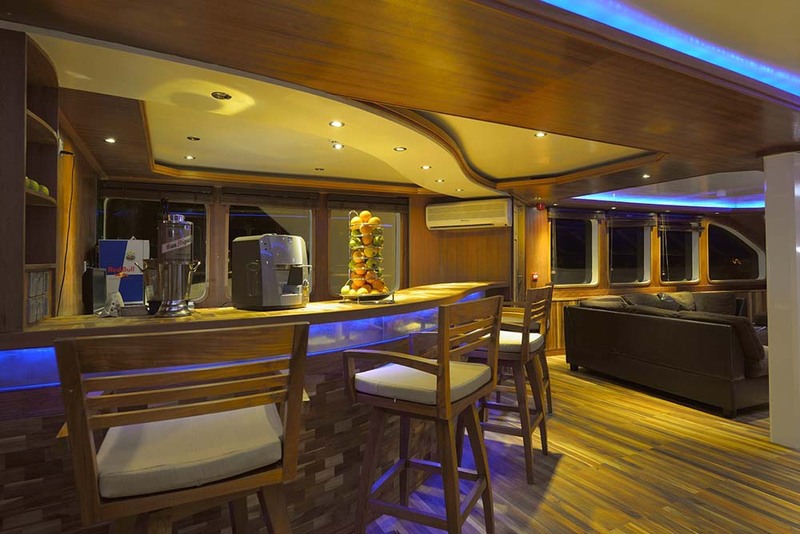 Eating, drinking, reading, watching a movie, or just relaxing in the sea breeze is always an absolute pleasure in any of the communal areas of this remarkable boat. 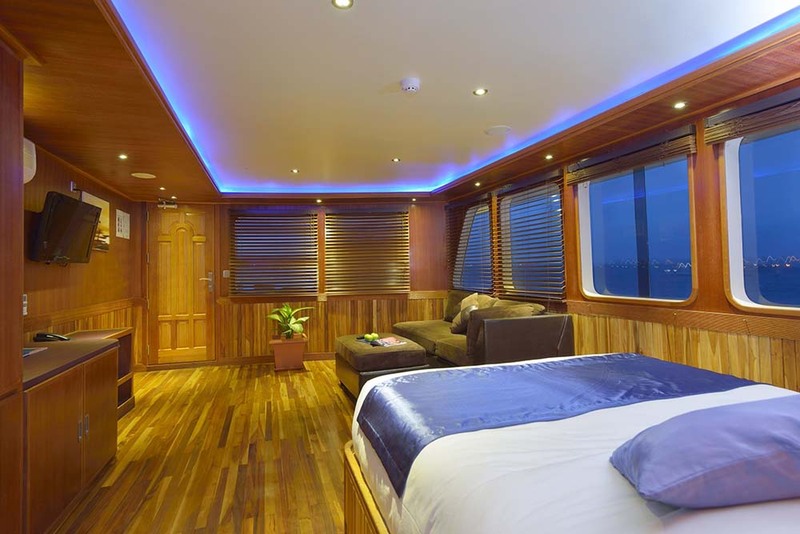 However, the private cabins are also so spacious and comfortable that guests may be tempted to spend much of their time in there. 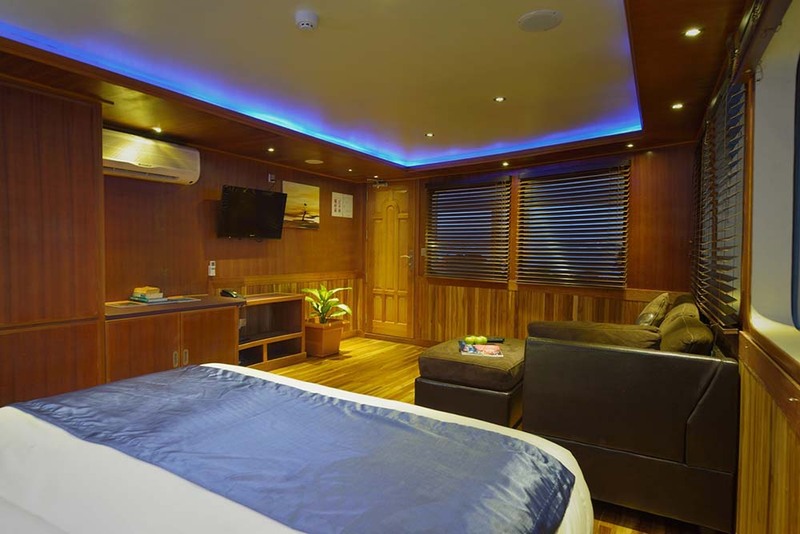 All cabins are air-conditioned, have private en suite bathrooms, mini-fridge, & flat-screen TV. 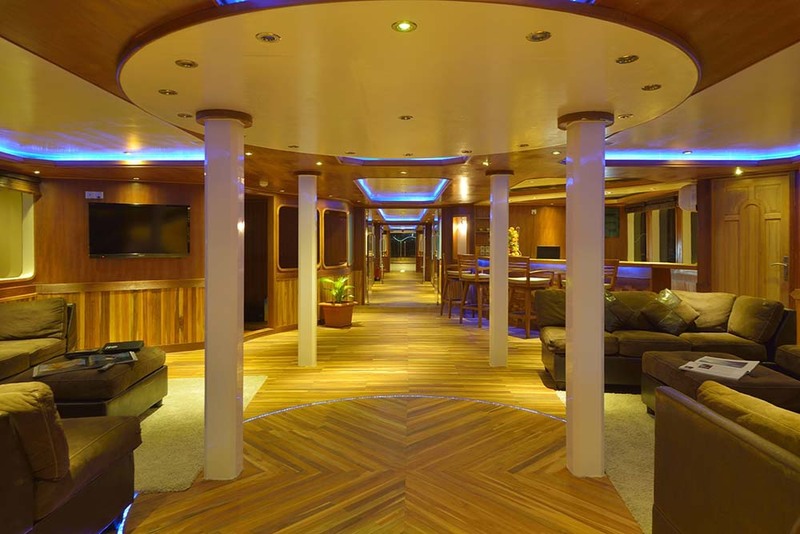 The boat’s lower deck is home to twin and double cabins. 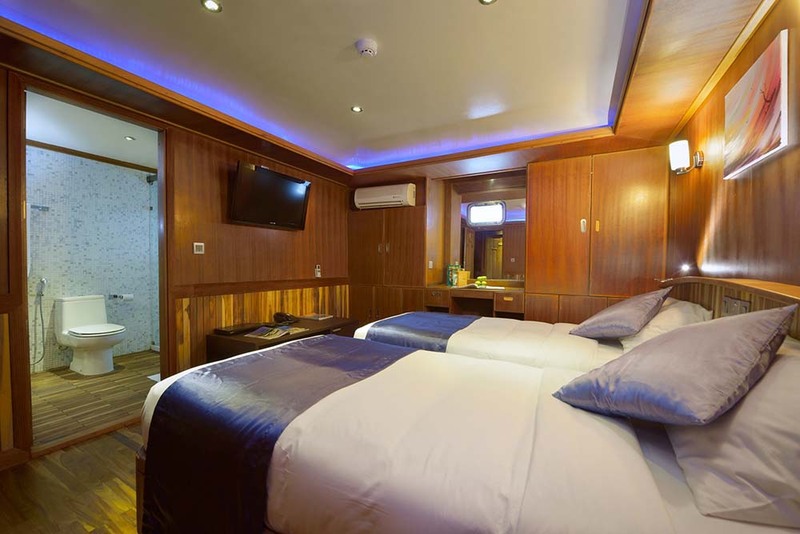 All are roomy, well-decorated and have private en suite bathrooms. 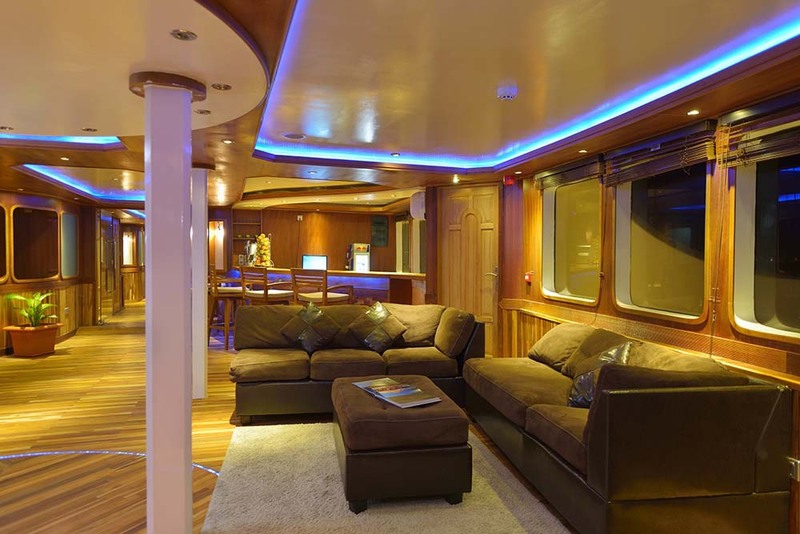 The main deck is taken up by a huge lounge area, with comfortable sofas spread around and a huge TV mounted on the wall of one side. 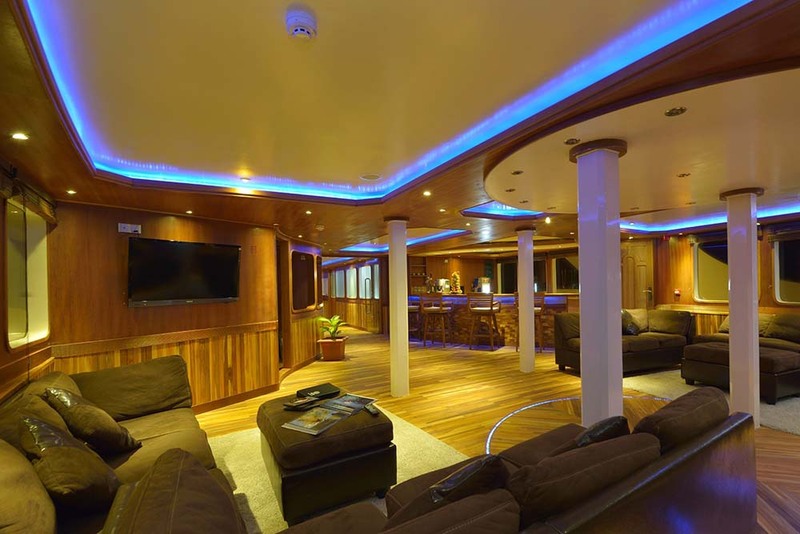 Towards the rear of the main deck is a large air-conditioned dining room, that has more than enough space for the boat’s 22 guests to enjoy dining all together, in small groups, or tucked away in a private corner. 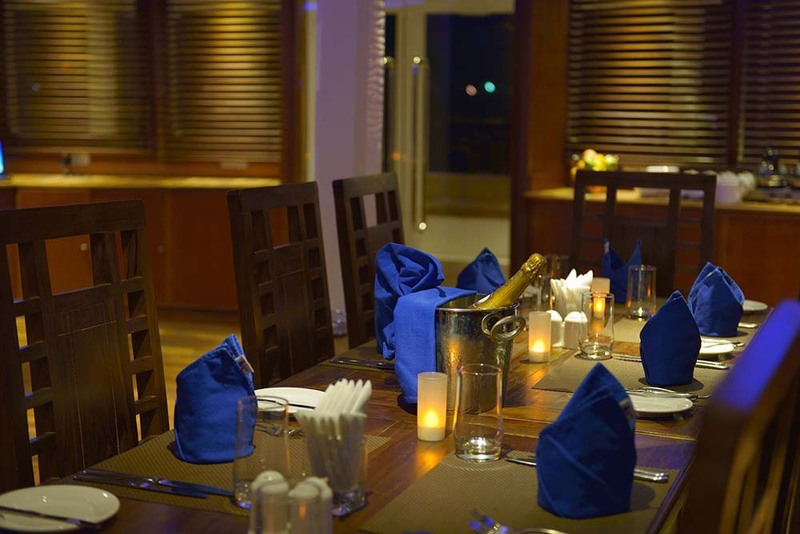 Food is delicious local & international cuisine, and served buffet style by the experienced chef. 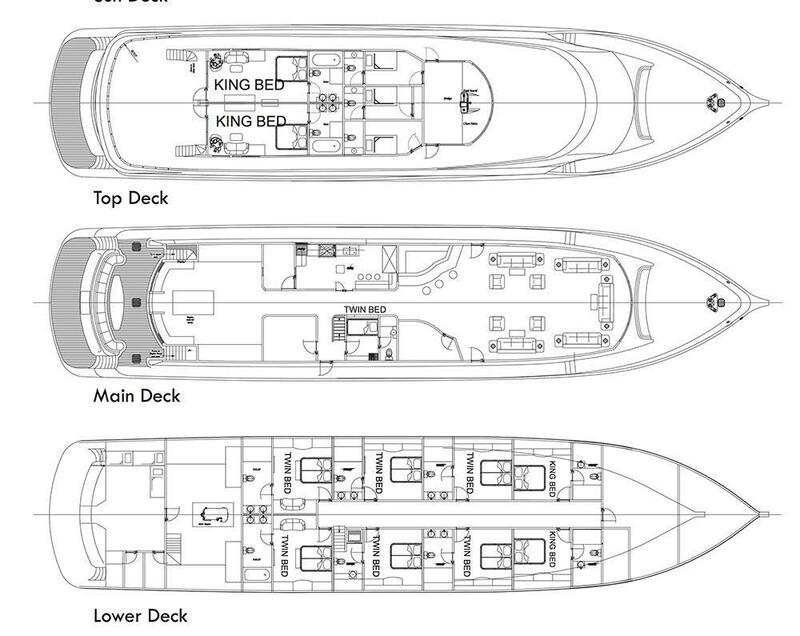 Outside on the front of the main deck is a large area of sofas and chairs, and at the rear is an outdoor dining area. 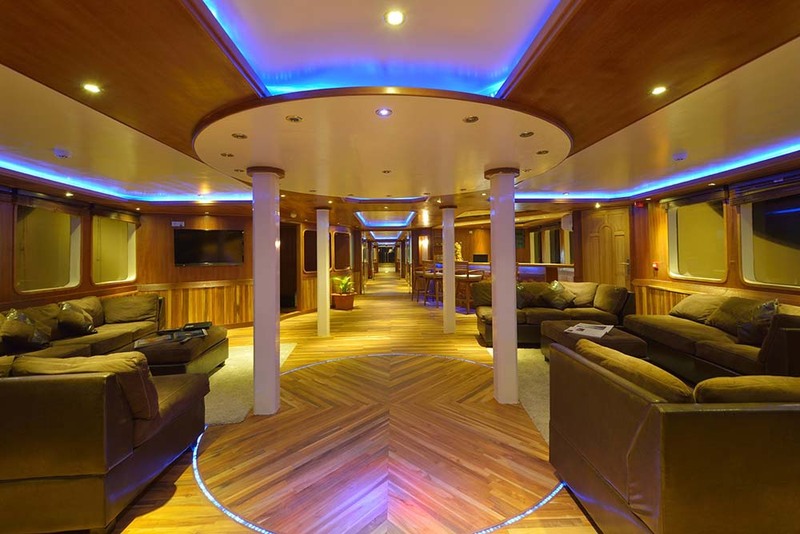 The upper deck of Maldives Princess live aboard is where the two huge suites are located. 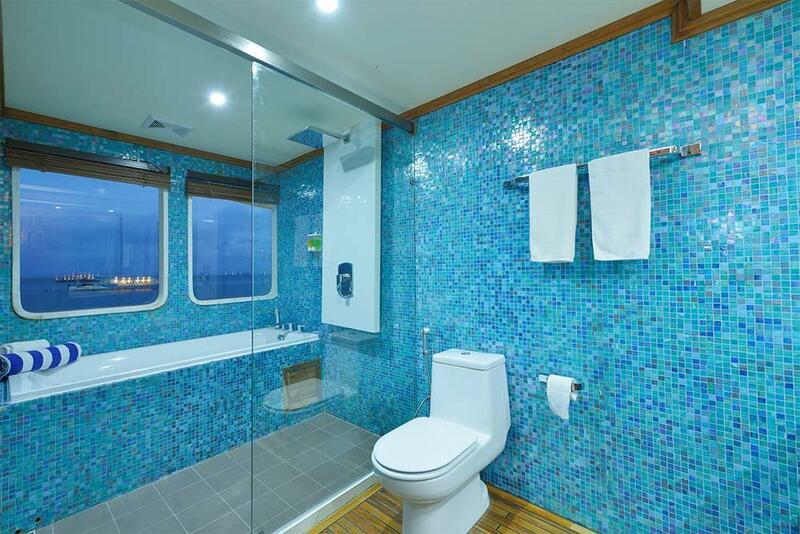 Both have large windows on two walls, giving the best views across the turquoise sea of the Indian Ocean. 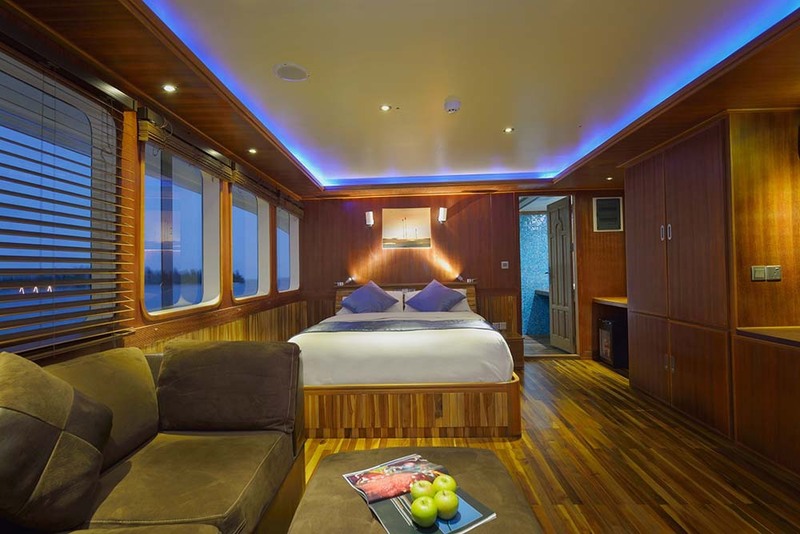 Each suite has a king-size bed, large sofa, writing desk, dressing table and a bathtub (& shower cubicle) in its en suite bathroom, which itself has two large windows. 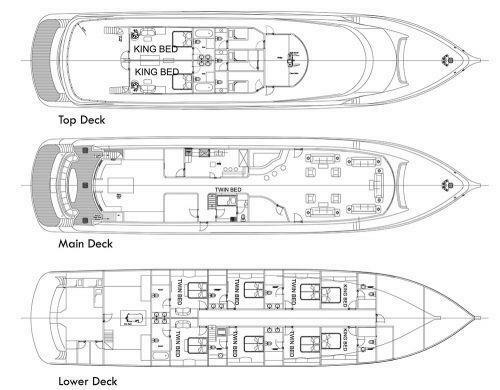 At the front and the rear of the upper deck are seating areas and some sunbeds at the rear. 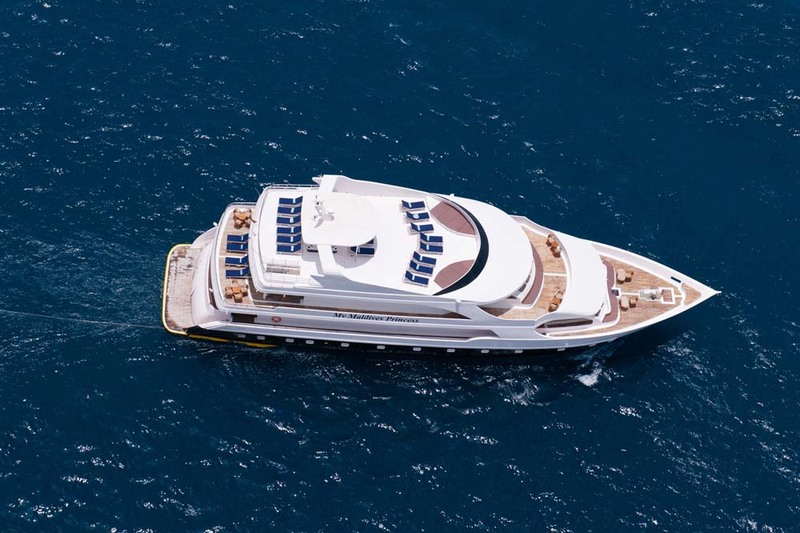 On the top deck there are 20 sunbeds and the popular Jacuzzi. 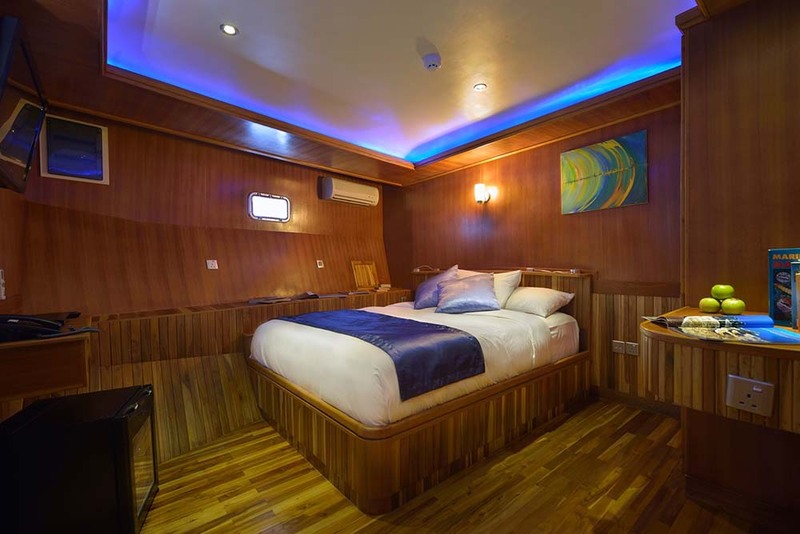 All in all, Maldives Princess is the pinnacle of luxury for Maldives diving cruises, but the rates for joining each cruise are lower than many would expect. Maldives scuba diving cruises on Maldives Princess are more than just relaxing on board, though. The crystal-clear water, healthy coral reefs and pristine beaches of uninhabited islands are what most guests come for. Marine life is abundant and varied. From the tiniest invertebrates to Manta Rays, Whale Sharks and even marine mammals. 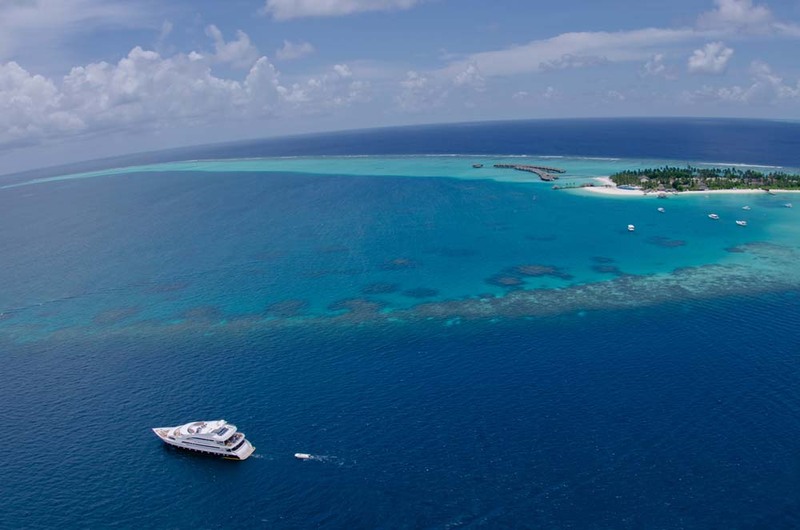 The Maldives has it all, thanks to opposing ocean currents bringing food for residents and attracting migratory species. 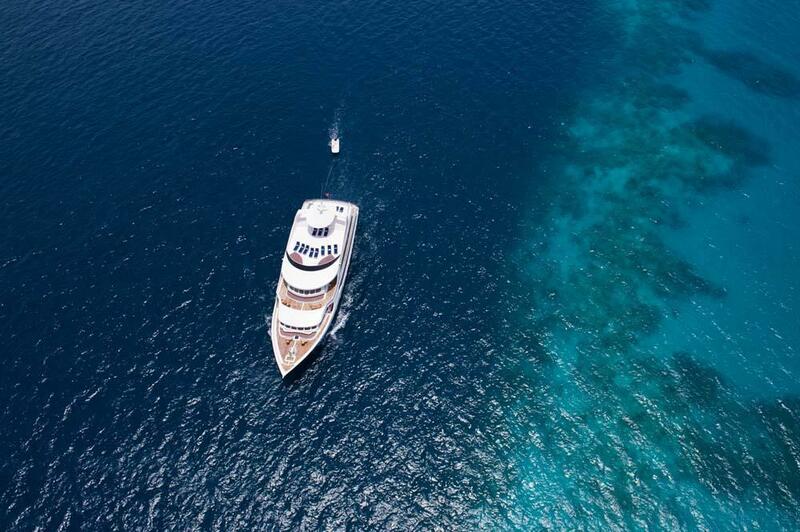 Maldives Princess divers are taken to each dive spot to experience Maldives scuba diving by the large (17m.) tender, known locally as a ‘dhoni.’ This enables for safe monitoring of each diver’s progress, and efficient pick up after each dive. Access on and off of the dhoni for divers is very easy, and there is always a member of the crew to assist. 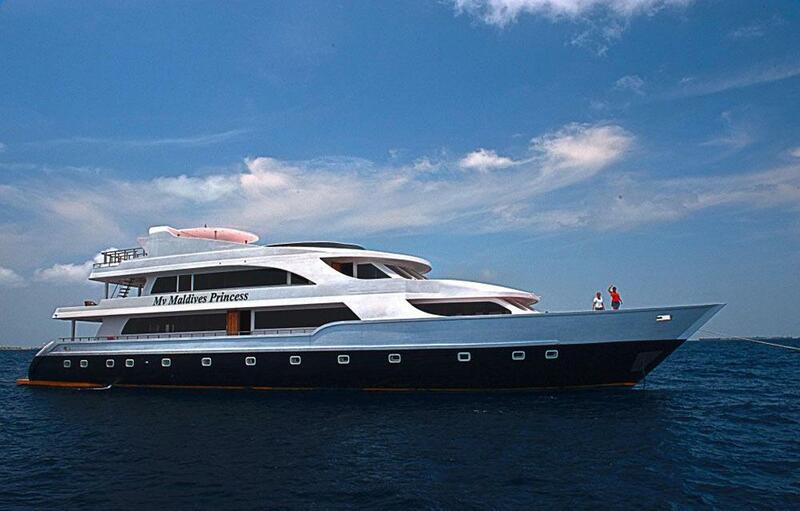 Nitrox-certified divers can enjoy free fills on Maldives Princess liveaboard cruises. 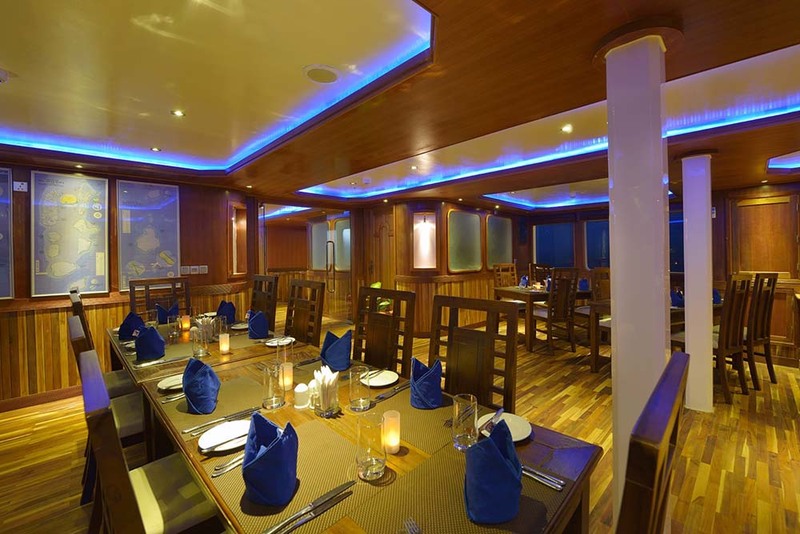 Maldives Princess’s itineraries vary throughout the year to ensure that the diving cruises visit the best Maldives dive spots at any given time. 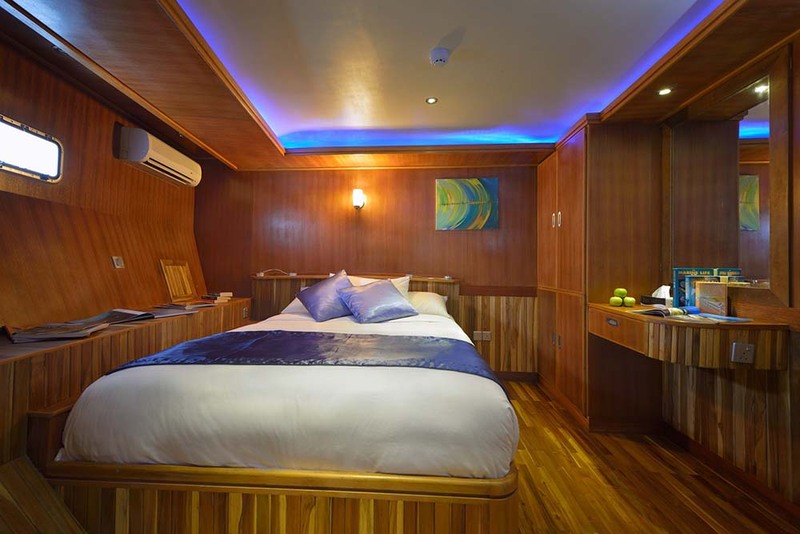 Thus allowing guests the best opportunities to see Manta Rays, Whale Sharks and other exciting marine life. 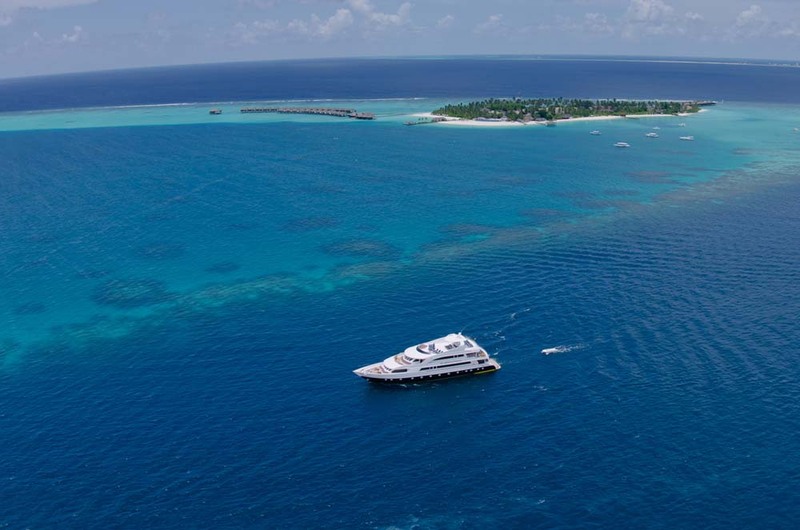 The most popular itinerary is ‘Explore Maldives,’ which focusses on the Ari Atoll, South Male, & Vaavu Atoll. 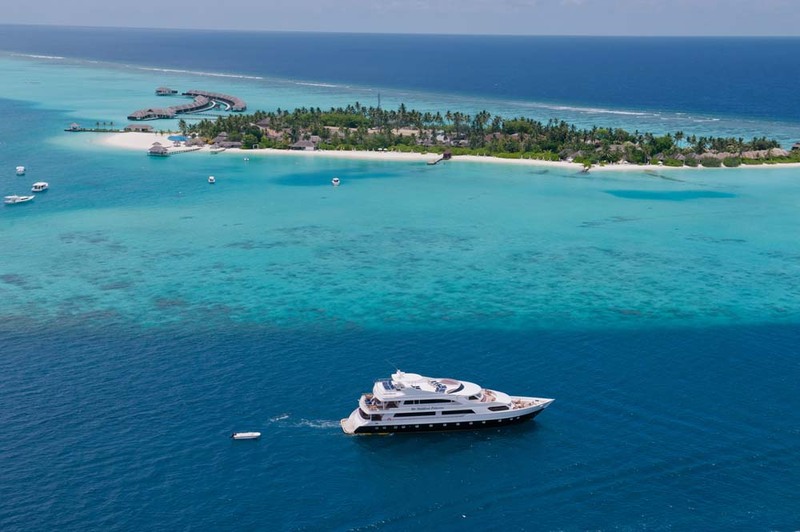 From July to September Maldives Princess goes a little further north to Baa Atoll & Hanifaru Bay because the seasonal sea currents at this time of year allow for better diving conditions. 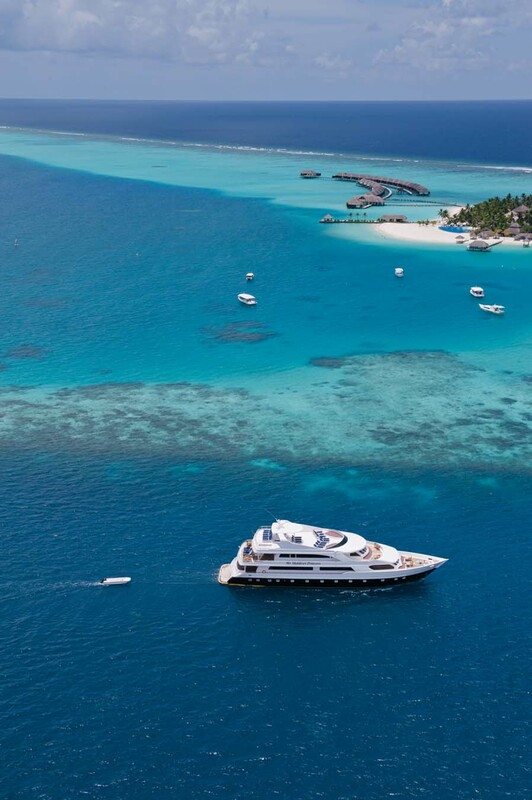 Occasionally, the boat sails to the southern end of the Maldives Archipelago. Please check the schedule or contact us for details. Built In: Republic Of Maldives. Water: 2 Water Makers Each Producing 12 Tons Per/day. Storage Capacity Of 20 Tons. Engine: 720hp V Type, Doosan Daewoo - Diesel. Compressors: 2 Bauer High Pressure Compressor. Instrumentation: Global Positioning System (GPS), SSB Marine Radio, Depth Sounder, Mobile Phones, Internet, Search Light, Binoculars, Map. 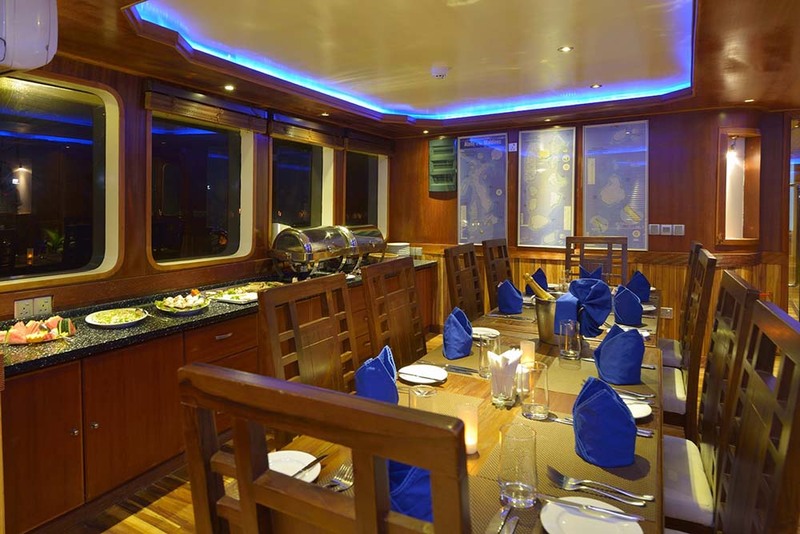 11 Spacious Cabins (9 State Cabins, 2 Suites) Can Be Booked As Double, Twin Accommodations. 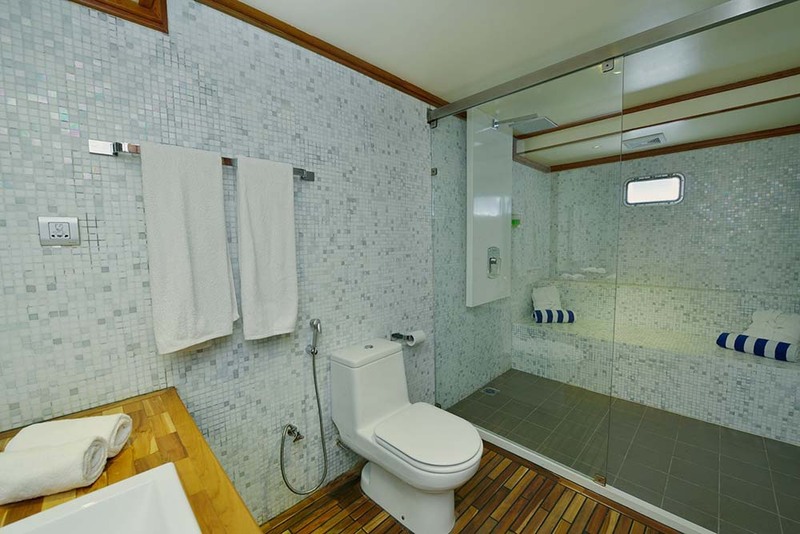 Each With Private Bath Containing Toilet, Vanity And Private Climate Control. LCD TV, DVD Player, Private Mini Bar, Electronic Safe, Telephone. Diving Dhoni: 60 Feet Dive Tender. 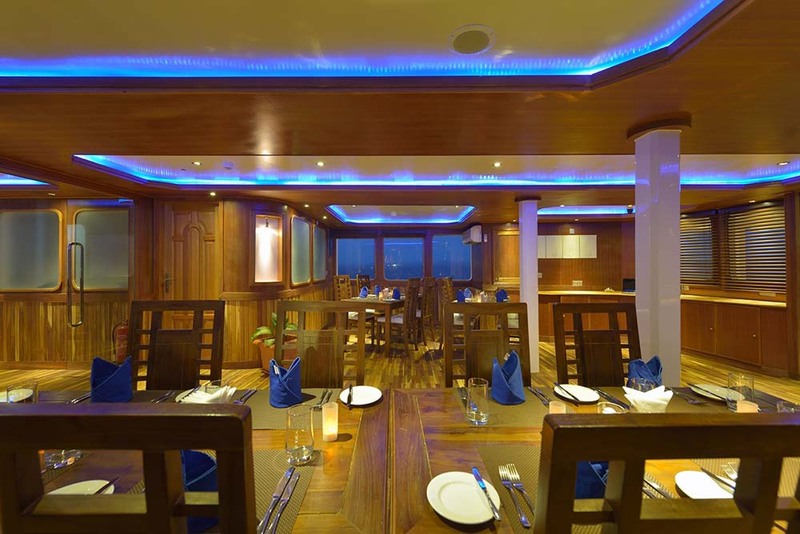 A range of Maldives scuba diving courses are available on Maldives Princess. 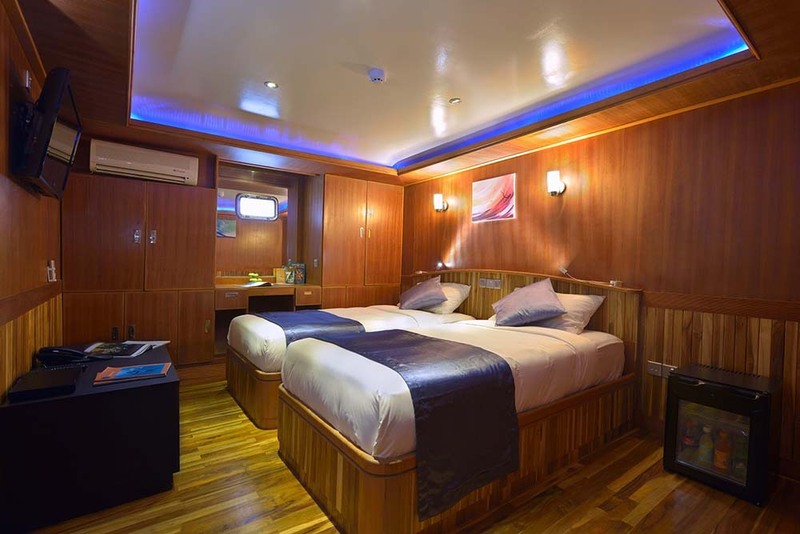 These include Discover Scuba Diving (DSD) ‘try dives’ for guests who have never dived before, Scuba Diver (inc. upgrade), Open Water Referral, and Nitrox, which is very popular because Nitrox fills are free on Maldives Princess. 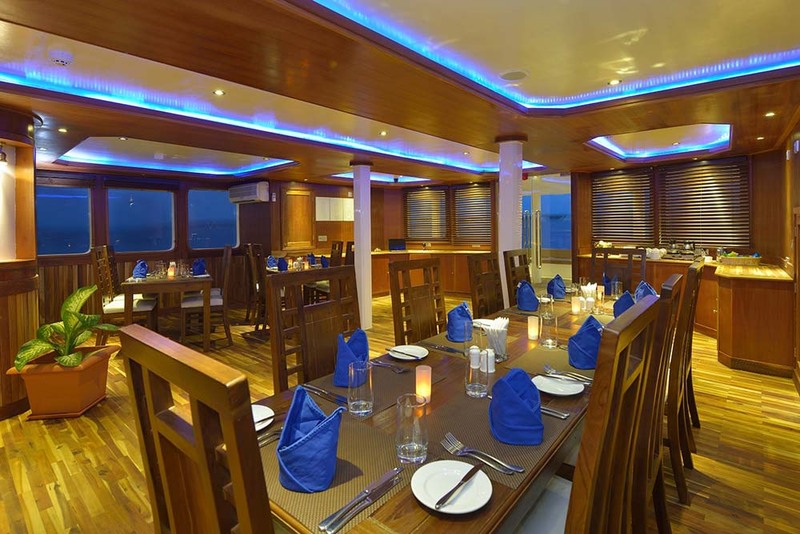 Maldives Princess guests can enjoy free scheduled transfers on the day of departure and return. These are most commonly from Male (Ibrahim Nasir) International Airport, but if you will be staying at a local hotel or somewhere else, please let us know. 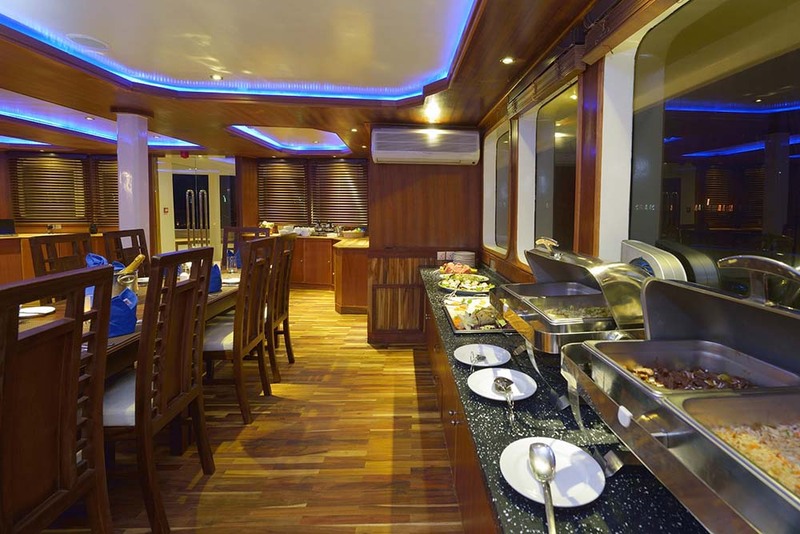 Full & partial sets of high-quality scuba diving equipment is available for rent on Maldives Princess. It is important to book any items you need in advance so that the correct quantity and sizes (plus spares) are available for all guests. Items paid for on board are subject to a 12% GST on the below prices.